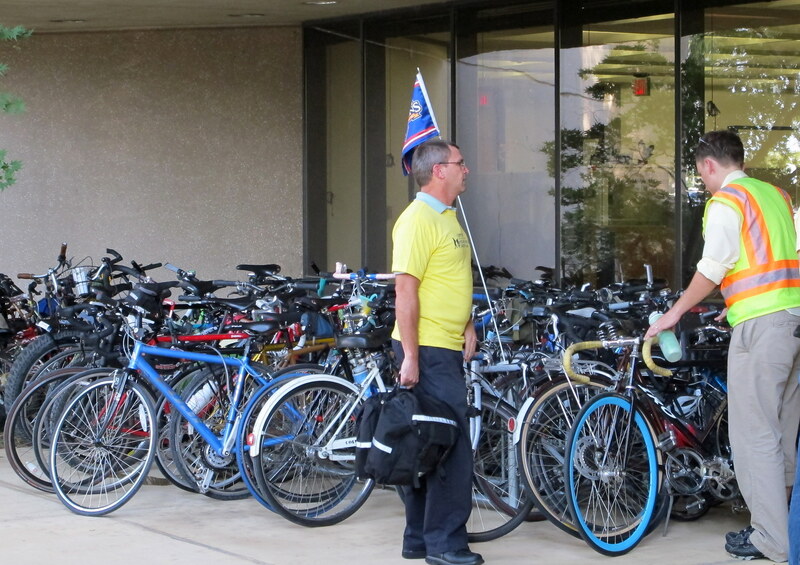 For an advocate of bicycling, attending the final hearing on a hike and bike master plan for Arlington, Texas, was like traveling to a parellel universe. It’s a place where bicycles are an insidious threat to the American way of life. A place where a plan for bike lanes is an effort to deprive righteous, God-fearing folks of their automobiles. A place where bicycle lanes drive down property values. A place where apartment buildings attract transient riff-raff and become hotbeds of crime. A place where the Founding Fathers almost certainly would have been against bicycles — had they been invented then — because they are tools of tyranny. A silver-haired man described bicycling as a “hobby,” dismissing its use as an alternative means of transportation. “Don’t ask me as a taxpayer to spend millions of dollars for somebody’s hobby,” he said. Arlington, by the way, is a city of about 375,000 between Fort Worth and Dallas. It’s home to the Dallas Cowboys’ stadium, the Texas Rangers baseball team, Six Flags Over Texas amusement park and a large campus of the University of Texas. But it has the dubious distinction of being the largest city in the United States without public transportation. Each time a public transportation initiation was put on the ballot, it was voted down, led by the critics who argued that buses would cause congestion and bring unsavory characters to Arlington. 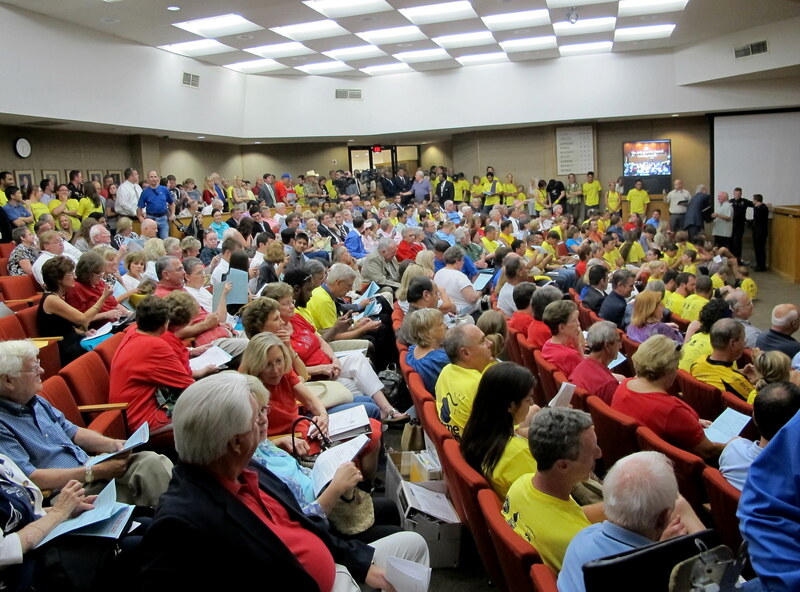 More than 300 people attended the 2 1/2-hour public hearing and City Council vote on the proposed Hike and Bike System Master Plan. At a cost of about $55.3 million over three to four decades, the plan calls for building a 125-mile network of on-street and off-street bike facilities, as well as 149 miles of sidewalks to help residents get from neighborhoods to city parks, schools and other destinations. Judging from cards and lists signed in the lobby outside the council chamber, 182 people attended the meeting in support of the plan and 133 people in opposition. Allowed two minutes each to voice their opinions, 43 people spoke in favor and 27 against. 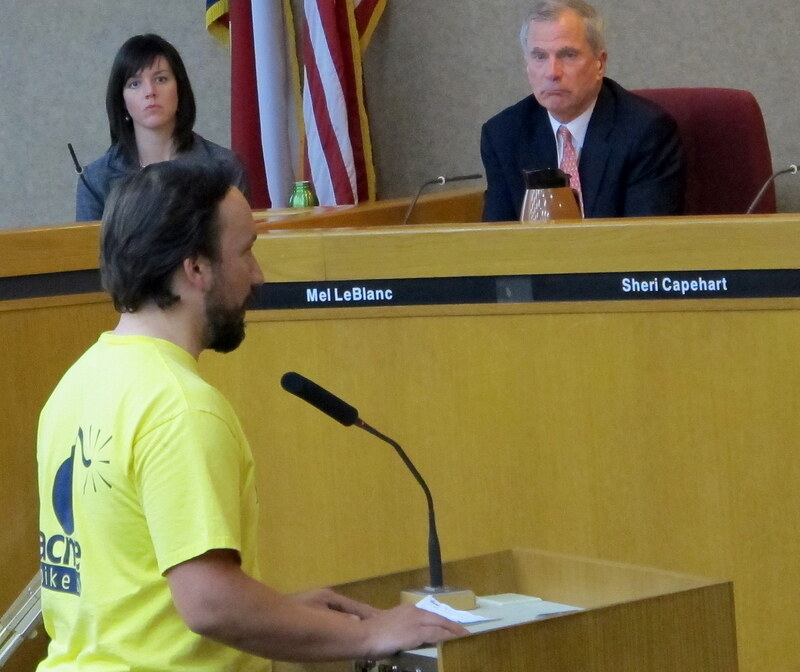 Many attendees who favored the plan wore yellow T-shirts with messages of support paid for by Acme Bike Co. and other local businesses. The shirts were distributed outside City Hall. Among those who spoke in favor were representatives of the Arlington Chamber of Commerce, the Downtown Arlington Management Corp., the University of Texas at Arlington, the Arlington Convention and Visitors Bureau and Dan Dipert, an Arlington businessman who for 40 years has operated a fleet of charter tour buses that bear his name. Describing himself as a “Razorback through and through,” he told of a recent visit to his native Arkansas to see his mother in Conway. Home to the University of Central Arkansas, Hendrix College and Central Baptist College, Conway has bicycle lanes. The speaker who attracted the most attention was Jodi Lee Ryan, who bicycles despite her multiple sclerosis. 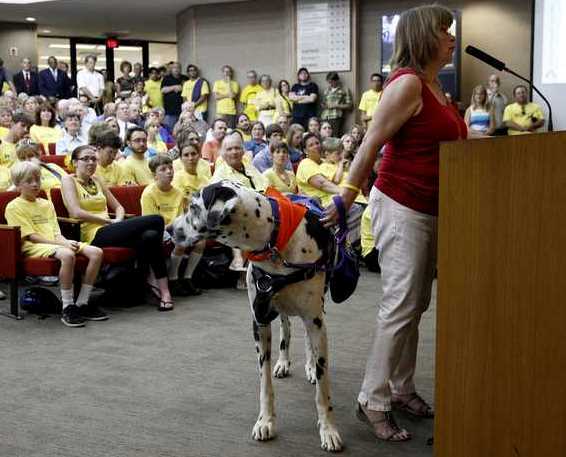 She came with her service dog, Cinder, to urge the council to support the plan. As the council prepared to vote, a motion to kill the hike and bike plan was offered by Councilman Mel LeBlanc. “The city of the future is not the city that puts bike paths in,” LeBlanc said. “It’s the city … that has a very low tax rate and a very low debt ratio. The city of the future is the city you can move to and not be robbed by taxes.” LeBlanc’s motion was defeated. Robert Shepard, who offered a motion to approve the plan, responded emotionally to critics in the audience who claimed that the hike and bike plan was railroaded through without input from Arlington residents. He said that the plan was the subject of several public hearings during the two years that it was being developed, that the city contacted neighborhood associations for opinions on the plan and sent out multiple e-mails and placed newspaper ads about the hearings. The plan being voted on, he noted, was itself a compromise in response to critics. The final plan, called “Option C,” he said, was scaled back significantly from the original “Option A,” an $88 million proposal that called for 281 miles of on-street and off-street hike and bike paths. 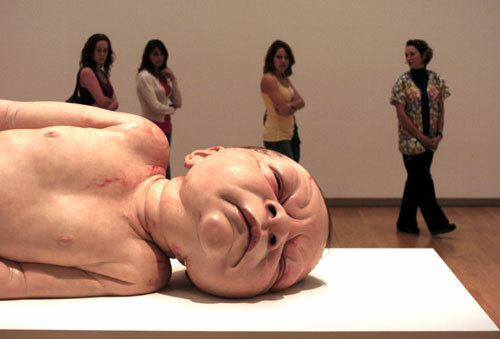 “Any notion that this was shoved down anyone’s throat is frankly offensive to me,” Shepard said. In the end, the council voted 5-4 in favor of the plan, with council members LeBlanc, Robert Rivera, Gene Patrick and Mayor Cluck voting against it. As I said, some of these folks live in a parallel universe. Every day I come out of work and see the giant Arlington monument to recreation. Paid for by tax money. Cowboy Stadium. While I might not agree with many particulars of most bike plans, the notion that cyclists are lesser taxpayers than an NFL franchise is rather bizarre and an official of that city arguing in favor of fiscal restraint may lack some credibility. That’s a pretty good description of the meeting, although it downplays the depth of references to the “shadow conspiracy” so much of the opposition referred to. I suspect Dr. Cluck’s opposition was crafted to keep the Tea Party yahoos from coming wholly unhinged. What I am curious about is how bike lanes could possibly lower property values. And how the opponents of bikes and the unsavory characters riding them haven’t noticed the variety of strip clubs existing on Arlingtonian soil. I’m from Seattle, and we have constant battles like this over bike lanes and alternatives to motorized transportation. This is supposed to be one of the most bike friendly cities in America, and it still doesn’t feel very safe to ride on the streets, even in the bike lanes. I can’t imagine what it’s like in Texas, especially in a city with no public transportation. Over the years, I’ve seen some insight to the parallel universe you describe. There are some people who can’t possibly imagine walking even 2 blocks to the corner store. They drive it, every time. To do this, they of course need gasoline. They are addicted to it like any alcoholic or cigarette smoker or heroin user. Anyone suggesting they should try giving up driving for even one second is seen to be the antichrist. It explains a lot. Try taking away any substance from a severely hopelessly addicted person, and they will act in exactly the same way as the people you saw in the meeting. To them, the world is truly ending. Adding a bike lane creates a physical reminder that someone out there would suggest they give up that gasoline even for 1 second of their life, and that CANNOT HAPPEN. Every excuse under the sun will come out. It’s not even the slightest stretch to think it could be a UN conspiracy. Taxes are the pretext, but the fear of traveling somewhere without their car is a far deeper psychological trauma than you can imagine for these people. I don’t know how you can cure them. Extremely high gas prices might do it, but that would cripple our economy. Well, good luck out there! You’d cure it in the Seattle area by doing away with bicycle helmet laws for adults and having a culture that encourages non-bicycling people to ride instead of insisting that REAL bicyclists must outfit themselves in lycra and look like they’re about ready for the Tour de France before they can ride. As an overweight 50-something woman, I adored riding my bicycle in Europe on a daily basis to do errands and every-day tasks last year when I lived there. It was easier than getting into the car. I just hopped on the bike and went, waving to my equally plump 80-year-old neighbor on her bicycle as I left home. I come home to the Seattle area…and I get looks from both the bicycling enthusiasts and non-bicycling folks, clearly wondering what I did to lose my driver’s license, because nobody like me could possibly have a reason to ride a bicycle, unless I’ve been “bad” somehow–either having lost my driver’s license or finally come to realize the error of my unhealthy ways. The humiliating prospect of having to explain or be patronized on how “good” I am for trying to be “fit and healthy” is a HUGE disincentive toward riding a bicycle for people like me, and can diminish any enjoyment I might have had in the sheer riding of it. Enjoyment of riding bicycles is key. Don’t destroy it by patronizing people who try it., or be snobbish about what kind of bicycle (motor-assisted or not) I might be riding, just because I can’t yet ride up a 6% + road grade that’s so prevalent here in the Seattle area. Trust me, the snobbishness is there. Even my husband, who is a huge bicycling enthusiast, can see it. My memory of commuting to work from Arlington to Fort Worth includes great evenings on very wide roads (Green Oaks Road to the western stretch of Pioneer Parkway) – and also includes two separate incidents of pick-up truck drivers veering over into the shoulder to drive me off the road. 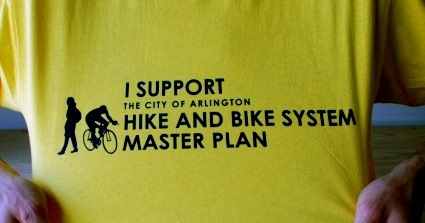 Trails and dedicated lanes Arlington are a matter of public safety, not a UN take over. Not only do taxpayers cover recreational facilities, well cited above, not only do they cover vastly more expensive, privately owned for-profit sports facilities, as well cited with Cowboys Stadium and let’s not forget the Ball Park at Arlington (no kids, it’s not that kind of park, you can’t play there). Taxpayers paid to have the very roads built – widened to multi-lane boulevards – that the bike lanes are suggested for. Flip back 30 years, and you’ll find people railing against having their property trimmed back under eminent domain law to make these roads wider for the public good. The point is: you don’t need everybody on board to create a vibrant city. They’ll adjust over time. The wing-nuts have no right other than to stamp their feet and whine. If they’re not city leaders, they don’t get to vote. If you are a city leader, you are supposed to look at the whole, and the whole future, of your city. The Tea Party murrain sweeping through the weaker herds gives dunces the elation that they alone have discovered plumbed the depths of civil documents, and they proceed to cling to clauses and misquotations issued by Fox News. Pitiful, that such a pleasant environment is infested with militant dolts. I miss Arlington, not the dolts.